A unique series of Books and Apps for the Surveying, Engineering, GIS Professionals and aspiring Students. Photo: My daughter Bridget and me. I have several decades of land surveying and civil engineering experience. I was first licensed in 1983 in Wyoming and Utah. In 1986 I became licensed in Arizona. I was appointed a United States Mineral Surveyor in 1986. 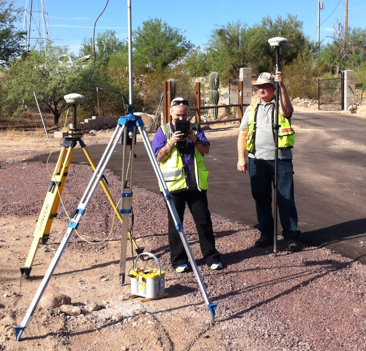 I have been practicing Land Surveying in Arizona since 1990. I became a Certified Federal Surveyor in 2007. I have several decades of computer programming experience related to computer aided drafting and coordinate geometry. I am the pioneer in the use of Digital Signatures in Arizona for professional documents. My experience includes the preparation of right of way plans, writing legal descriptions, research at the recorder&apos;s offices and field surveying. In addition, I have extensive experience in field surveying for numerous ADOT construction projects in the Phoenix Metropolitan area and right-of-way plans preparation for ADOT. As a project manager I have overseen and prepared all elements on a variety of projects. I have many years of practical field experience and office experience in utilizing computers for CADD, word processing, engineering and surveying calculations. I am very experienced in Microstation, Microsoft Word, Excel, Traverse PC and many others. As a United States Mineral Surveyor, I have worked on Mineral Surveys in Arizona, Wyoming and Alaska. As a consultant, I performed the field surveying, office calculations and drafting for a large mining company in Jeffrey City, Wyoming. As a consultant, I performed the survey analysis, calculations and drafting for a large mining company in Platinum, Alaska. I recently completed a large Mineral Survey near Superior, Arizona.